This route winds along the contours on the side of Airedale, with extensive views of sheep country, and stone growing out of the landscape - farmhouses, barns, stone walls in all directions and the occasional village or small town. 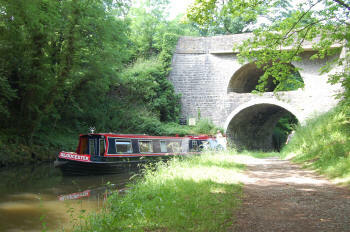 At Greenberfield, you leave the summit level, and paradoxically pass into the wildest scenery, where you could moor for days with no human contact but the occasional passing boat, walker or cyclist. 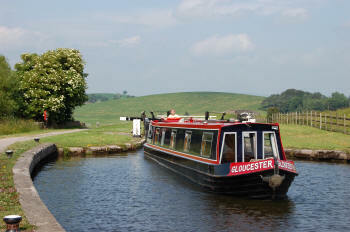 Across the valley, you may see a boat behind a stone wall, apparently heading in the same direction as you on a parallel canal - only to find that you meet on a hairpin bend, and pass. 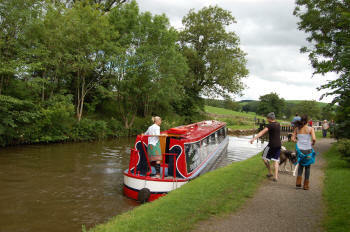 Then the Bank Newton flight leads you round and down into Gargrave, an unspoilt canal village. 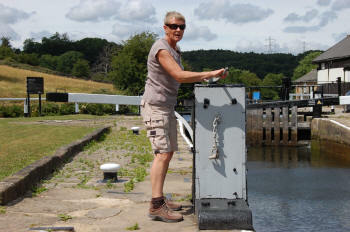 From here it's level all the way to Skipton, with views of the hills and lots of swing bridges. 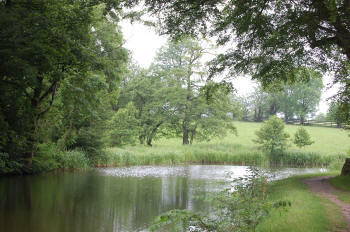 Quite suddenly, you are in Skipton, and can moor right in the centre of town. Explore the castle, cattle and street markets and shops, before turning to head back. 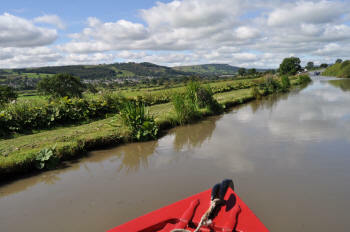 Head for Skipton, then carry on along the side of the Aire Valley, with extensive views through the trees. 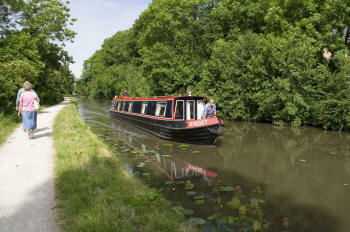 Pass through the romantic village of Kildwick, clinging to the hillside with the canal going placidly through the middle. Silsden is a bigger town, with shops and eating places. Keighley Golf Course has astonishing rhododendrons in May. Moor at Bridge 197A and walk down to East Riddlesden Hall NT, a 17th century manor house with fine garden; or get a bus to Keighley Station, and take the steam train (of Railway Children fame) to Haworth, and walk up the steep hill to the Bronte Parsonage. Turn at the top of the Five Rise. 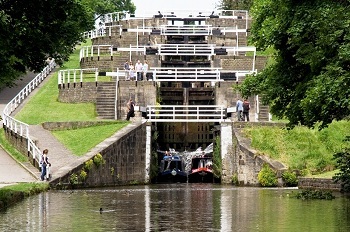 At Bingley, pass down the Five Rise, the first of several staircases � the most dramatic sort of lock. Soon you arrive in the World Heritage Site of Saltaire, Sir Titus Salt's Italianate mills and model town founded on the wool of the alpaca. See the streets named after his eleven children, and find his statue in the nearby park. There's also a splendid display of Hockneys - he is a Bradford lad. Turn after Bridge 218.